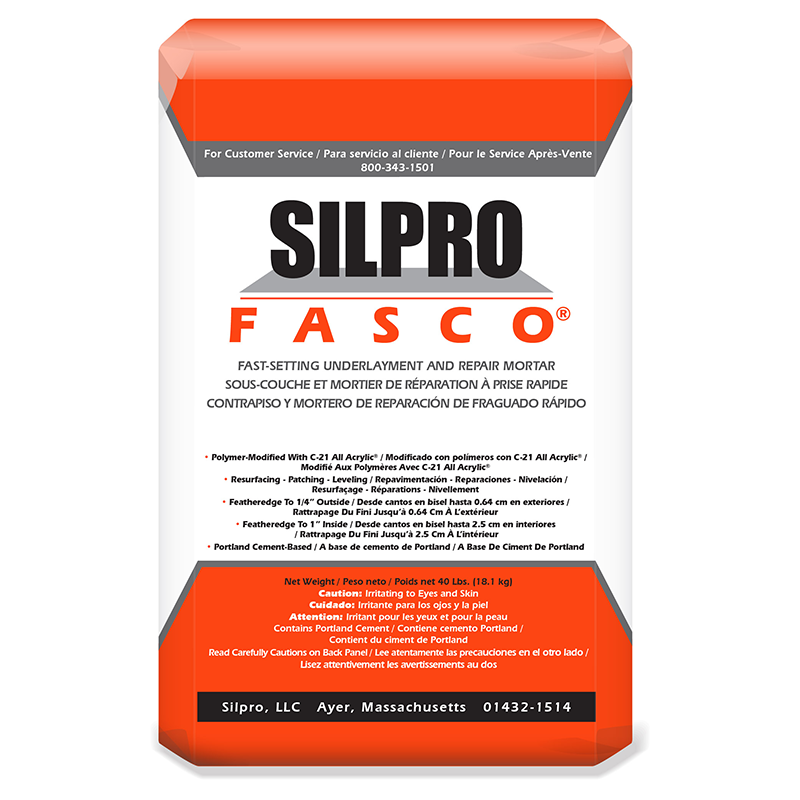 SILPRO Fasco®, mixed with SILPRO C-21 All Acrylic® admix, is a fast-setting, polymer-modified, Portland cement-based mortar. Fasco™ has been developed for the successful flooring contractor who is interested in ways to meet demanding schedules without compromising on quality. As a superior patching, resurfacing, and leveling material for use over concrete and approved wooden substrates, Fasco® facilitates same-day installation of floor coverings because of its ease of installation and short cure time. Additionally, Fasco® provides a durable wear surface that can be used both indoors and outdoors, above or below grade, on horizontal and vertical surfaces, and can be applied down to a featheredge. Excellent adhesion: Fasco bonds readily to new and old concrete, wood, plywood, cement plaster, stone, and clean steel. Moisture resistant/Exterior use: Fasco may be used in exterior applications as well as in areas subject to high moisture and freezing conditions.